Are You Ready To Submit Work to a Poetry Contest? Many amateur writers view poetry as a purely personal thing. And that’s absolutely OK to do—writing can give you an outlet to express your feelings and thoughts in an entirely judgment-free zone. But as you continue to write more poems, fine tune your style, and revise, you may find that there’s a piece you are just so proud of that you can’t help but want to share it with the world. So how do you know whether or not you’re ready to submit your work to a poetry contest? Read on to find out more! If you are considering submitting your work to a poetry contest but do not believe that it is “good enough” yet, remember this: You’ll never know until you try! One of the first things that you have to do when planning to take the next step with your poetry is to banish your doubts about the process. Even if you find you are not immediately successful, this will only inspire you further to keep working and improving your poetry. And if you are successful on your first or second try, all the better! If doubts are standing in your way, push them aside and have confidence in the quality of your poetry; it will make submitting to a poetry contest a much more enjoyable experience! Once you’ve banished all of your hesitations about submitting, it is time to get your work in final-draft shape. Read your poems once, twice, three times, as many times over as you can to look for spots that could be changed, as well as for errors and typos that you may have missed. One of the best things that you can do to make sure your work is truly polished is to give it to a friend to read; make sure that this is someone you trust to give you an honest opinion. They may even pick up on things that you missed! 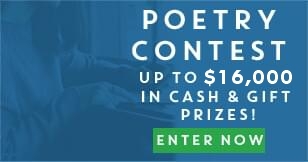 A poetry contest like the one offered by Poetry Nation is a great opportunity for both new and experienced writers to share their work. Click here to find out more about the specific rules for the contest and to learn about the contest’s prizes as well. Remember- be confident in your writing and you could end up having your work seen by thousands and thousands of fellow poetry lovers! This entry was posted on Thursday, February 26th, 2015 at 9:50 pm. You can follow any responses to this entry through the RSS 2.0 feed. You can leave a response, or trackback from your own site.